Fernanda de Faria is a master student with the Fishing and Fisheries Research Centre at James Cook University in Townsville and her project is looking at the species composition of the recreational catch of sharks of the GBR and also, because most sharks are released, she is looking at possible catch and release effects on shark populations. In order to collect data, Fernanda has been going out on recreational charter fishing boats collecting photos and tissues (for species identification) as well as a small blood sample (for physiological stress analysis). The stress levels are measured against different parameters like play time, hooking location, air exposure time and etc. In addition, Fernanda has individual recreational fishers on board their on boats taking photos and when possible, tissue samples of every sharks they catch. And here is where you can help. 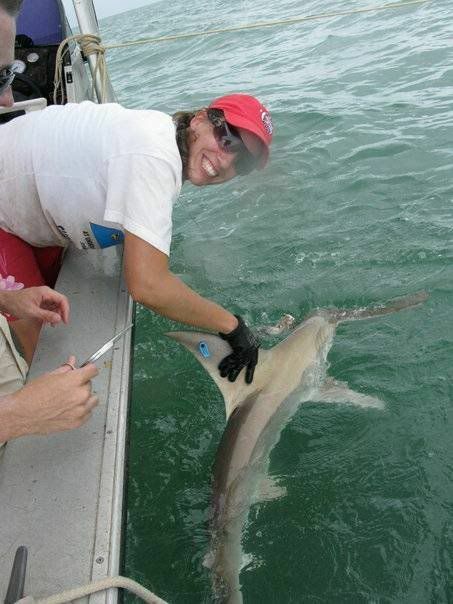 If you are interest in helping with shark research and conservation, please contact Fernanda and she will give you a “ data collection kit’ and instructions. The data collection process is very simple and shouldn’t interfere with your fishing. With the results of the project Fernanda aims to compile a species list for the recreational catch of sharks in the GBR and provide recreational fishers with advice on best handling practices in order to guarantee the survival of the sharks after being released.